Thursday, January 15th, the Pinedale Fine Arts Council presented Calo Flamenco Ballet De Marin Gaxiola. 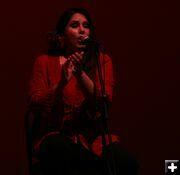 Flamenco is a mixture of song and dance, with clapping and instruments used to keep the rhythm. No two performances are alike. 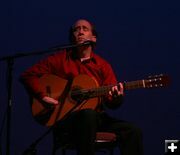 The music was composed or arranged by Chris Burton Jacome. 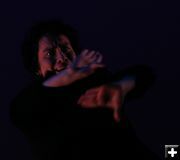 Martin Gaxiola Gaxiola dances with expression and emotion. Olivia Rojas Rojas sings and keeps the rhythm with her hands. Bernadette Gaxiola Gaxiola dances with a graceful energy. Musicians The musicians played and sang beautiful music. 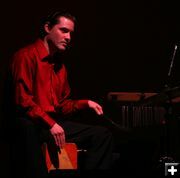 Kristopher Hill Hill played percussion for the evening's performance. This included playing the wooden box he was sitting on. Floor Mic Microphones were placed on the floor across the stage to allow the audience to better hear the steps. Chris Burton Jacome Jacome has played with some of the greatest flamenco performers of the era. Marielen Jacome Jacome performs Tormenta De Gracia, which means 'Perfect Storm'. Duran & Gaxiola Beautiful costumes and lighting were used in addition to the dance and music. Amalia Duran Duran dances with energy and passion.